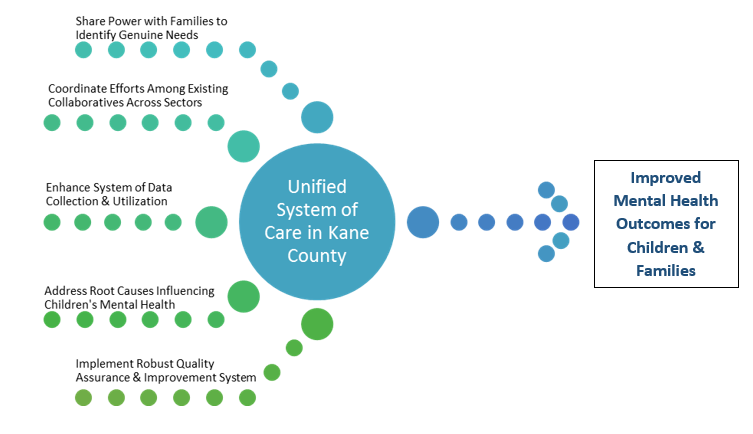 The Illinois Children’s Healthcare Foundation (ILCHF) has awarded the Kane County Health Department an initial $200,000 planning grant to improve the system of care for children and their families. Once the initial planning year is completed, Kane County will be eligible for an additional $2.1 million over the following six years for implementation. This project will be a collaboration between the health department and many committed partner organizations and collaboratives working to serve the mental health needs of young people in Kane County. 3) capacity building to increase wraparound services. These data driven efforts will emphasize measuring and evaluating quality and family satisfaction. The project seeks to meet the unique needs of all children, utilizing a “no wrong door” approach that facilitates a family’s access into coordinated care, regardless of how they enter the system. Regular, coordinated review of the data by the partners and a strong commitment to continuous quality improvement will identify sub-populations whose needs are not being met. The major strength of this project is that multiple sectors are committing resources to seek upstream solutions together in an effort to reduce the burden on families. Additionally, individual agencies that contributed to the successful funding application and have formally committed to participate on the Community Planning Team for this project include: Association for Individual Development; Family Counseling Services of Aurora; Family Service Association of Greater Elgin; Kane County Regional Office of Education; Renz Addiction Counseling Center; TriCity Family Services, VNA Health Care and YWCA Metropolitan Chicago. Families will also participate on the Planning Team to provide the critical consumer perspective. We will be sharing activities and other updates on this page as we begin the project.